Hello! Happy Spring! Finally, right? 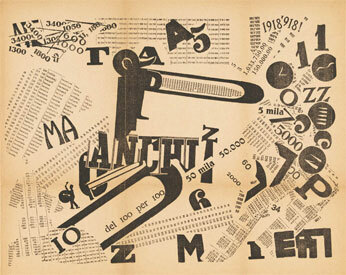 Like the spring, the Gazzetta has been missing in action for some time. In spite of its supposed quarterliness, it’s been nigh six full months since the last issue! Did you miss me? 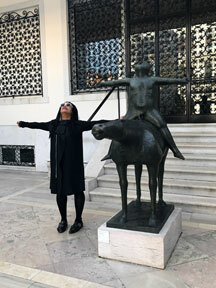 After having my work, And the Movement of the Tongue, performed by a chamber orchestra in Los Angeles, and then heading east for an engagement in Williamsburg VA, I traveled to Europe in early November, for the sole purpose of attending the 2017 Venice Biennale. For the first time in all my years going, I traveled with companions – my sister and a dear friend. It was a seriously focused art-seeing expedition, and we remained in Venezia for nearly two weeks making thorough and repeated visits to all the pavilions on both of the main Biennale sites (Giardini and Arsenale) as well as many of the off-site pavilions and participating galleries. I had a wonderful and completely engaged time and felt, quite frankly, stuffed by the end. Some unexpected stand-outs included an enormous Damien Hirst show displaying artifacts and “mockumentation” from the excavation of a fictional shipwreck. The pieces were both ridiculous and stunning. Also, a sprawling exhibit called Glasstress at Palazzo Franchetti showcased works by major artists like Ai Weiwei, who collaborated with Murano glassmakers to create monumental and very uncharacteristic works in glass. I was also quite taken by the Azerbaijan Pavillion, which showed striking new media installations alongside sculptural constructions of poetically arranged traditional acoustic instruments. Earlier in the year, I had heard a piece on Radio Lab about Alex Hai, Venice’s first ever woman gondolier – who later became the first transgender gondolier. 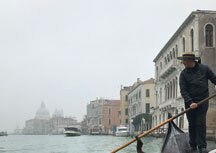 I decided to look him up, and very easlily found his website, so we hired him for a gondola tour. Alex was a pure delight, and turned out to be a fount of knowledge about Venice, a great conversationalist, and the best choice we could have made. We got on so well that we actually exchanged information and met for drinks a few days later. When I returned stateside, I presented a ROOM series event called Tongue Teeth Lips, which was a total blast, with an all-star line-up of Bay Area avant singers. 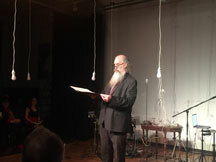 Then I flew east for a gala event at Cave Studio, home of the New York intermedia butoh company LEIMAY, honoring Meredith Monk. There was a multi-course dinner served up in slow motion by members of the company, and performances by Missy Mazzoli, Meredith herself, and yours truly. In the new year, as I scrambled to finish a commissioned choral work for the San Francisco Girls Chorus, I entered into a crazy pattern of travel. My calendar from the end of January through basically now, was dressed in horizontal stripes (and, yes, they did make it look fat.) For some reason my schedule was filled, for three months, with trips to every imaginable educational institution. 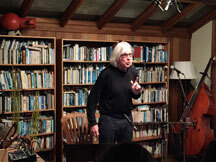 Every week I alternated being home and then away again for visiting artist residencies at music schools and art departments – Rhodes College, Spelman College, University of Colorado at Boulder, Ohio State University, SUNY Oneonta, Brandeis Univeristy, and Haverford College – giving concerts at each one as well as talks, lecture-demos, and master classes. I criss-crossed the country so many times that I never sorted my jetlag, never fully unpacked, and could barely keep straigtht where I was exactly. And, between two of my east coast engagements, I flew on the smallest commercial flight I'd ever experienced – a 9-seater from Albany to Boston. Exhausting as all those residencies were, I really enjoyed meeting and working with so many students, sharing my work with them, and hearing their work. But I won’t lie: I’m relieved to be done with those calendar stripes for the moment. Somewhere in between all of that, I had the delightful opportunity to play with the Bang on a Can All Stars at Merkin Hall in New York. 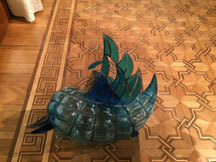 In celebration of 20 years of their People’s Commissioning Fund, they reprised my 1998 work, The Schmetterling. It was a joy to perform with them again. I also saw many great concerts and art exhibitions – both at home, and on the road. In San Francisco I saw the gorgeous “Soundtracks” exhibition, the Rauschenberg retrospective and Louise Bourgeois’ Spiders at SFMOMA. 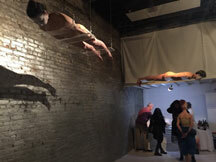 I saw Ian Winters' brilliant time-lapse video installation at Minnesota Street Project, and I attended all the San Francisco Contemporary Music Players’ concerts during Steve Schick’s final season as director. In Philly I made a pilgrimage to PMA to visit Duchamps' Large Glass, in Columbus I had another chance to see William Kentridge’s The Refusal of Time at the Wexner, and I saw Meredith Monk’s new masterpiece Cellular Songs at BAM in New York. 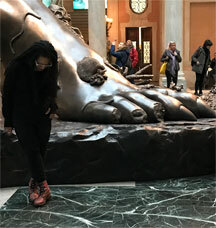 PZ with foot of multi-story high Hirst figure. Photos: Pamela Z, Elise de Jong, Charles Smith, and John Muse. 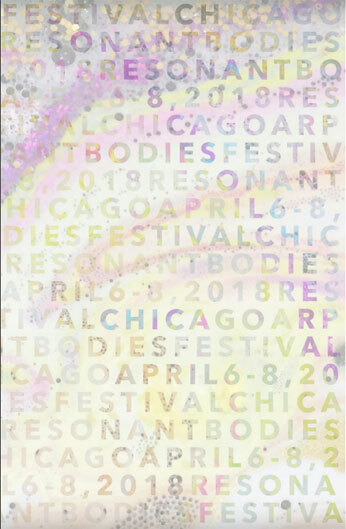 Pamela Z performs a set of works for voice and electronics (and strings) on a shared evening as part of the Resonant Bodies Festival at 7:30pm at Constellation in Chicago, IL USA. 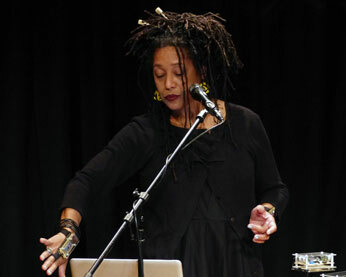 Pamela Z will perform a handful of her own voice and electronics compositions, as well as a couple of songs composed by Meredith Monk and by Björk on an evening that will also feature Eighth Blackbird flautist Nathalie Joachim and composer/performer Jesse Marino. This year’s festival runs April 9-14 at ODC Theater in San Francisco, and is devoted to works using speech, text, phonemes and vocal utterances as primary musical elements. The six-day extravaganza will include lectures, classic historical works, tape pieces, world premieres, luminaries and locals. 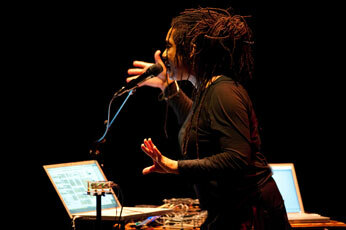 Pamela Z will open the festival's final evening with a set of works for solo voice and electronics including the San Francisco premiere of a new piece, and one piece for voice, tape, and chamber ensemble, as part of a shared evening with Jaap Blonk and Beth Anderon, on the closing night ("Ink Conclusion") of Other Minds 23. Pamela Z will perform as part of a chamber chorus along with Amy X Neuburg, Kevin Baum, Joel Chapman, Sidney Chen, and Randall Wong, performing historic spoken chorus works by Ernst Toch (including the famed Geographical Fugue). The Now Hear Ensemble will perform Pamela Z's And the movement of the Tongue (originally commissioned by Kronos Quartet) in an evening called “Storytelling” on Thursday, April 19, 2018 at 8:30 p.m. at the Automata Theater in downtown Los Angeles. 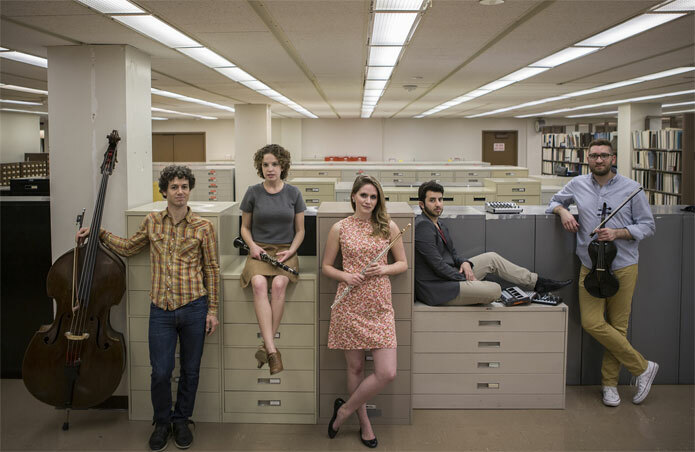 The program will feature works for string quartet that focus on the power of storytelling, and will also include Ted Hearne’s The Answer to the Question that Wings Ask, Federico Llach’s El libro de losflasheos (The Book of Trippin’), and the world premiere of a new work by Valentín Pelisch, 4 weak receptions from a dying TV (#1- Charles Mingus, Los Ángeles), written for the Now Hear Ensemble. Pamela Z will perform a concert of works for solo voice, electronics, and video and the second half of a shared evening at New Music Gathering 2018. Appearing in the first half will be Angélica Negrón, Eunbi Kim, and Naked Eye. The San Francisco Girls Chorus will premiere Pen Pal, a new commissioned work for chorus and tape by this year's composer-in-residence, Pamela Z, at their end-of-the-seaon concert at Herbst Theater in San Francisco. 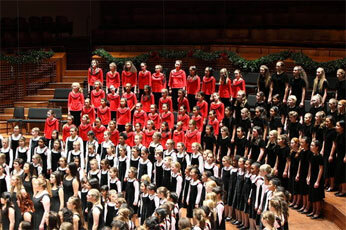 The work will be performed by all of the girls in the Levels 1-4 choruses. 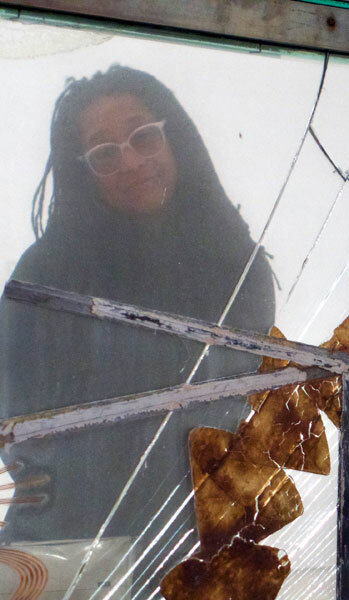 Pamela Z will give a performance of solo works for voice, electronics, and video as part of the NIME Conference at the Moss Arts Center on the campus of Virginia Tech. Choreographer Sara Shelton Mann will present work-in-progress showings of her new work Echo, with a score by Pamela Z, performed by dancers Jesse Zaritt and Anya Cloud. 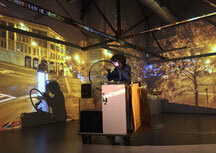 Pamela Z gives a solo performance of works for voice and electronics as part of a shared evening at Red Bull House of Art during Detroit Art Week.